First off – as Dany mentioned last week, his time with us has sadly ended and I’ll be taking the reins as the sole POCUS fellow and COTW curator. I don’t expect to be able to match his level of Dad jokes (he did write the answers to last week’s COTW below, for those of you needing one last plethora of puns), but hopefully I’ll be able to follow in his footsteps by bringing you weekly utlrasound goodness. This is a 79 year old female with a history of metastatic cervical cancer, recently noted to have multiple pulmonary emboli on CT. She’s admitted to the ICU with respiratory failure, query pneumonia. This is her right costophrenic view. What do you see? A 64 year old woman is admitted to the ICU after a hysterectomy that was unfortunately complicated by profound hemorrhagic shock. She had no prior known cardiac history. She is being resuscitated and is on a reasonable dose of norepinephrine, but still has a borderline MAP. The team decided to empirically trial some dobutamine about an hour ago, which hasn’t seemed to help her BP much – if anything, it’s actually become a bit worse. As you’re in the room scanning, the nurse asks you if she should turn up the dobutamine to improve MAP. What do you say? 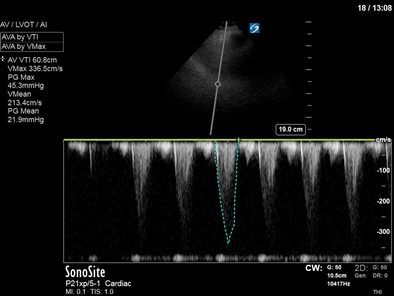 (Images are difficult, but you’re able to get the clips below – images 2 and 3 are both spectral doppler in an A5C view). Welp, for starters that ejection fraction doesn’t look normal, especially when you consider that this patient has a history of significant aortic stenosis. 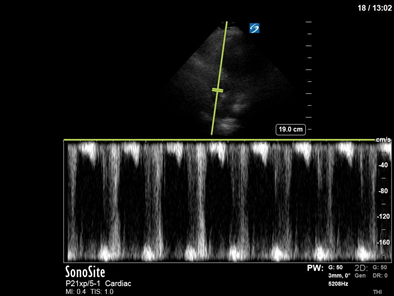 Boring old cardiogenic pulmonary edema in a patient with severe aortic stenosis right? Have a closer look at his aortic valve, or whatever that is where the valve should be. 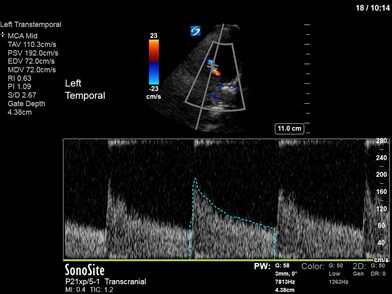 This is most consistent with endocarditis (although the lack of independent motion of the thickening on the valve is atypical which suggests this may be funky endocarditis, possibly of a marantic nature). Blood cultures are negative so far but this gentleman is off to the OR after some medical stabilization and I guess we’ll have to wait and see if pathology can help us make sense of this. Here it is a again on TEE, because TEE. Those of you who were on the mailing list last year will remember that Middle Cerebral Artery velocities aren’t just for vasospasm. 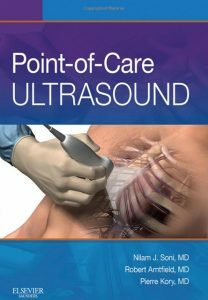 One of the most bestess utilizations we make of them in the ICU are in estimation of ICP. This is the (Systolic pressure or velocity – Diastolic pressure or velocity)/ Mean pressure or velocity (doesn’t matter if it’s pressure or velocity since it’s a ratio). What’s more, because this is a ratio, the PI doesn’t change with whether you’re PW beam is in plane with the flow or not. For more info on TCD for the intensivist (or the resuscitationist in general), check out the attached article.